Hot off its 100th episode and the death of Jonathan Kent, The WB's Smallville will again step into the spotlight with "Cyborg," an episode featuring the DC Comics character of the same name. "Lee Thompson Young, who is playing Victor Stone, is a terrific actor and we're very excited about it," Smallville executive producer Al Gough told The Continuum. "A sympathetic doctor releases a half-human/half-machine subject named Victor who was being held captive and experimented on by LuthorCorp. While making his escape, Victor is struck by Lana's (Kristin Kreuk) car. After watching him walk away without a scratch, Lana calls Clark (Tom Welling) to investigate. Clark befriends Victor and promises to help him find his girlfriend, but Lex (Michael Rosenbaum) traps Victor and takes him back to LuthorCorp." 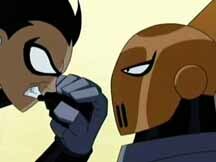 Gough said that Cyborg will be facing the same types of issues he did in the Teen Titans comics and animated series. "Victor Stone is a high-school football star who has a full ride to USC, but then he's in a terrible car accident," Gough said. "In our version, LuthorCorp takes him on as a project and sort of builds the limbs and the artificial intelligence that goes into that. "It's really a question, just like in the Teen Titans show, of, 'How much humanity do I have? How much machine am I?' Clark teaches him how to control his abilities. And he realizes his life isn't what he thought it was going to be, but he can still have a fulfilling life, and Clark helps put him on that road." The episode was written by Caroline Dries and directed by Glen Winter. 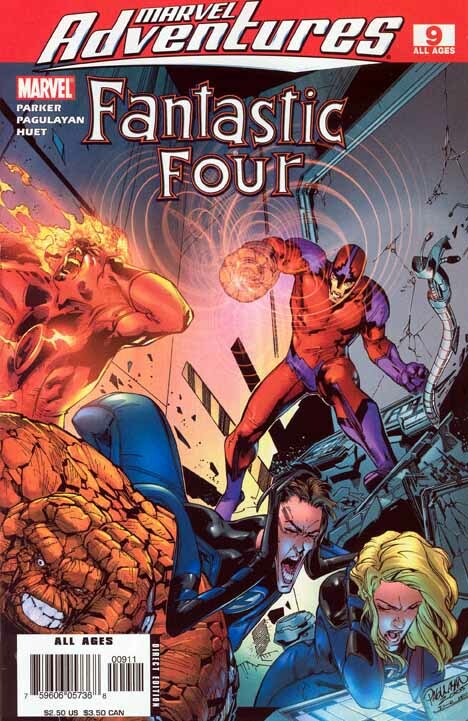 Titles include 4 #27, Ares #2, Marvel Adventures Fantastic Four #9, Marvel Zombies #3, Sensational Spider-Man #23, X-Men #182, X-Men: The 198 #2. For covers and five-page previews of upcoming Devil's Due Publishing titles arriving in stores on Wednesday, CLICK HERE. Titles include Purgatori #4, G.I. Joe: America's Elite #8 and Killer 7 #1. After selling out at DC Comics less than a week after arriving in stores on Jan. 18, Infinite Crisis #4 is going back to press for a new printing. Scheduled to arrive in stores on Feb. 15, the Infinite Crisis #4 Second Printing reprints the story written by Geoff Johns, and illustrated by Phil Jimenez, George P�rez, Ivan Reis, Andy Lanning, Lary Stucker, Marc Campos, Oclair Albert, Jimmy Palmiotti and Drew Geraci. "The new printing features a pencils-only version of the issue's cover by Jim Lee. "I'm glad everyone is enjoying it so much," said Group Editor Eddie Berganza. "I know it's been a labor of love for all of us, and we're working extremely hard to make it the best crossover we can possibly make it." The new printing will cost $3.99. * To the right is the colored version of Michael Turner's variant cover for Ms. Marvel #1. Click on the thumbnail for a larger image. * Furious Fist of the Drunken Monkey: Origin of the Species will debut from Silent Devil in June. A three-issue full color mini-series by writer/artist/creator Rich Stahnke, Furious Fist of the Drunken Monkey is about an alcoholic chimp named Chip and his toad sidekick, Al. Chip came to possess a ring of alien origin and when it converts to an oversized gauntlet, his natural speed, strength, and agility are increased. Chip's ongoing dilemna in life is whether or not he's going to use the glove to fight crime and make the world a better place or continue leading his slacker lifestyle and use the glove as the ultimate can opener. In some of his earlier adventures he's faced threats like The Gene Gnome, the Copper Curler, and the Exhibitionist. This new series kicks off with an encounter with a big-gun-toting and excessive-pouch-wearing guy who goes by the name Deathblud. * Coming Friday: Dark Horse news -- and much more!! !